This, I contend, is simply wrong. I do, indeed, “endorse” Aristotle, and I even start from him as I explicitly write (page 4). Still there are two differences. The first is that I, differing from Aristotle, do not introduce the distinction between “good” and “bad” regimes already from the beginning. Therefore I start with three categories rather than Aristotle’s six. Thus, and to be more specific, when dividing rule by one (my dictatorship) into good and bad regimes Aristotle gets kingship and monarchy, when dividing rule by the few (my oligarchy) into good and bad regimes he gets aristocracy and oligarchy, and, finally, when dividing rule by the many (my direct democracy) into good and bad regimes he gets polity and democracy. The second difference is that I add the category of representative democracy. For us this category is of course necessary even if Aristotle, for obvious reasons could not know anything about it. It appeared about two thousand years after his time. Now, these terminological mistakes of Varacalli had been of limited importance, had he stopped there. But he continues using them for further unreasonable criticism. Thus he writes that my “discussion of dictatorship is unimpressive” since I fail “to distinguish unjust rulers like France’s Louis XIV and England’s Henry VIII from good and decent men like France’s Louis IX and England’s Edward the Confessor.” This is a very remarkable comment since I make the distinction mentioned most emphatically. A whole section entitled “Repressive and non-repressive dictatorships” (pages 231-6) is devoted to exactly this issue and I there I mention quite a number of non-repressive, or even benevolent, dictators, among them for instance Dinis of Portugal (1261-1325). And then, leaving the dictatorships for turning to the oligarchies, Varacalli makes a very similar comment. He thus writes that my “analysis of oligarchy also suffers from the ability [inability?, my comment], to divorce oligarchy, the bad rule of the few, from aristocracy, the good rule of the few”. This again is utterly strange. Having defined oligarchy the way I do (pages 253-5), and which is very clear, it is obvious that they can be good as well as bad. I write quite a lot about the properties of different oligarchies in this respect. For instance I mention Samuel Finer’s characterization of Venice–at least until the end of the seventeenth century–as the best governed state in the world. After this I will now make just one more comment. Varacalli writes that “[r]elying heavily on the work of Mancur Olson, Moberg argues that ‘a state is characterized by its monopoly of violence’ (108).” Yes, I do rely heavily on the work of Mancur Olson, but not in the respect mentioned. The idea about the state’s monopoly of violence rather comes from Max Weber as mentioned on page 2. Mancur Olson, on the other hand, is extensively treated in chapter 3 entitled “Basic theory”, not mentioned by Varacalli at all. Page 108, the one to which Varacalli refers, is in fact the opening page of chapter 4 entitled “Development and significance of the technique of violence”. This chapter is of great importance in the book, but still not even mentioned by Varacalli (except for the faulty page reference). Thomas Varacalli’s review is available here. 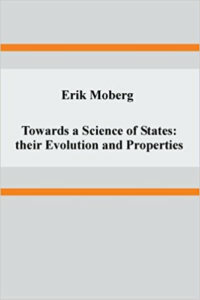 Erik Moberg received his Ph.D. at the University of Gothenburg. He has worked at the Swedish Research of National Defense, as an energy consultant, and currently as a journalist. He is author of numerous works, with his latest being Toward a Science of the States: Their Evolution and Properties.